What I assume is the final trip of the season starts with an early ferry from Dover to Calais, I do not use this service very often, but with no bookings available for the return trip via the tunnel, this was the only option. Unlike the tunnel ferry tickets can be discounted and services like aferry.co.uk and travelsupermarket offer fares not shown on the company websites. Even then, we had to make a booking that did not allow for extra time in our Sunday game to get the better far, and trust that the company would be lenient if we arrived a little late. The discounted tickets are important – they are less than half the cheapest alternative fare. From Calais, I have to drive to a different channel port, Le Havre. Despite the three hour drive, this is the best way both in time and money terms. As we have plenty of time, we avoid the toll roads as far as Abbeville, where we stop for a short while and take lunch. My passengers, Paul and Kevin both try a local “artisan” beer, which does not impress them much. I have to have coffee as the only man on the trip with a driving licence. We take the motorway from Abbeville to Le Havre, incurring a toll fee of €8. The hotel, Le Parisien is opposite Le Havre station and is of the “does the job” class. We take a breather before heading to Gonfreville l’Orcher – a dormitory town around a 15 minute drive away. The stadium is not far from the centre, and is the home of Etente Sportive Municipale Gonfreville l’Orcher, which not surprisingly is generally abbreviated to ESMGO. The sixth level of French Football is run by the regional associations, while the levels above are within the remit of the FFF. Each of the associations runs a single top division, generally known as Division d’Honneur. The number of other divisions below this differs from region to region. Most devolve the power at lower levels to district federations. 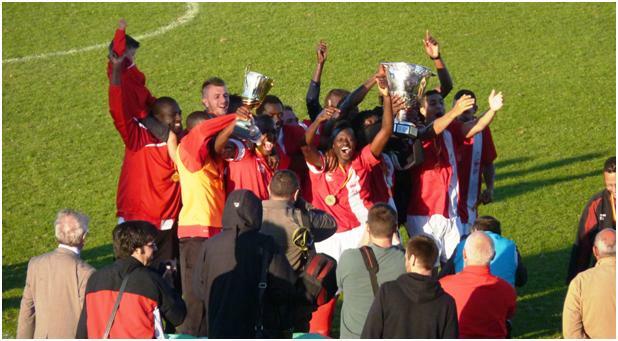 As champions of the Division d’Honneur Normandie, ESMGO will be promoted to CFA2 for next season. All of the regional associations run cup competitions for affiliated teams, and the majority of them operate a Senior Cup. In Normandie, this is the Coupe de Normandie Seniors. 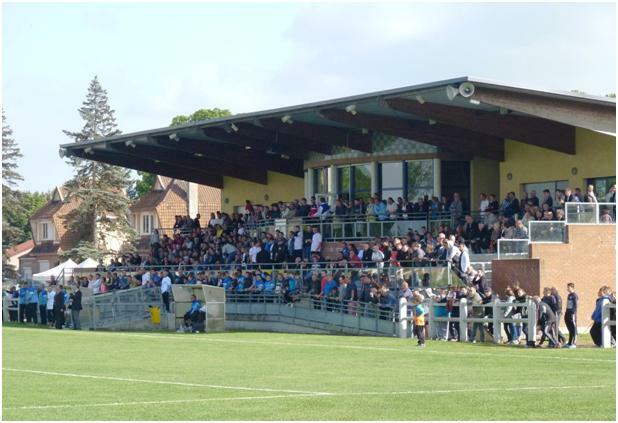 ESMGO were given home advantage for the final, (some regions do this, some play at neutral grounds), with the visitors being the second team of Le Havre AC, (a member of CFA2; again the highest and lowest levels that enters the cup varies from Region to region although I have not looked into them). 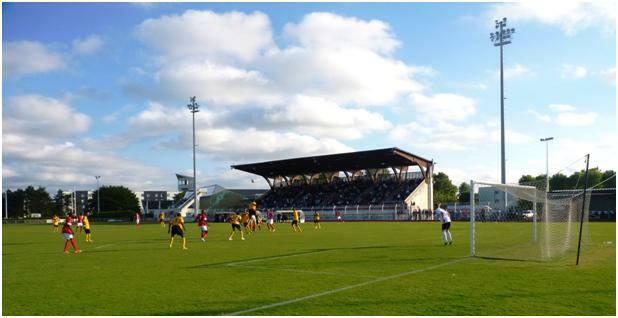 The stadium is a typical French municipal facility. A modern track and a single stand. In this case there is no spectator access around to other parts of the ground. As is common, other sports facilities are incorporated into the structure, or the area. The stand itself is quite large, and must hold more than 1000 seats. It is well elevated, and needs to be to allow viewing over the surprisingly high fence to the front. The roof sits high above the seating supported by a series of double curved wooden beams, which gives it an attractive appearance. The dressing rooms must be somewhere within the structure, with the players and officials emerging from underground to an area inside the track. A refreshments area has been set up to one side of the stand, and is doing a roaring trade, mainly selling sausages and chips. I indulge in the standard sausage, while Paul has the spicy version, (merguez). I have to wait a while for fresh chips to be prepared which gives me an advantage, Paul complains his are not as hot as they should be. Entrance to the ground is €5, a single sausage and chips is €2.50. There is no programme, but I obtain a copy of the team list quite easily. As for the game, it was a slightly strange affair, there was no shortage of competent football on show, but there seemed to be a lack of passion. The Le Havre side were very young, with an average age under 20. One or two looked a lot younger; Kevin was quick to point out Hery Randriantsara, only a little over 5 feet tall, and not much over 7.5 stone (from Le Havre web site), completely dwarfed in the midfield by an opponent around 6 foot and probable twice the weight. Still looking through the lists on the web page, he was nearly six months past his 19th birthday and by no means the youngest in the side. Le Havre have already updated the web pages with the squad lists for next season, and some of the players have graduated from the U-19 squad to the second team in the summer, while other players noted from earlier match reports seem to have left the club before this game. One of the Gonfreville substitutes is listed as a member of the Le Havre second team for next season! With a goal midway through the first half, and a second about 15 minutes from time, ESMGO seem to be cruising to a victory, and a very late goal from the visiting substitute Jordan Cuvier does not change this. After returning briefly to the hotel, we headed into town. Our first stop was the Brasserie Paillette, which appears to advertise itself as selling a local beer brewed since sometime in the 16th century. The beer bearing the name was in fact a very poor (and surely mass produced) lager. The place is also a very successful restaurant, which means they were far too busy to discuss the finer points of their less than fine beer with foreigners who do not speak the lingo. So after a very quick quarter litre, we repaired to Le Trappist, about a ten minute walk away. This is a popular spot, with a young clientele who appear to enjoy good beer. Not surprisingly most of this beer is imported from Belgium, (I did try a French Trappist beer which I also enjoyed). The best beers were bottled and at at least €5 for a third of a litre, were often double or triple the Belgian prices. Still, it was very busy and boasted two televisions from which we saw the end of the Uruguay-Costa Rica game and the entirety of England v Italy (except when too many others blocked our view). In the morning, we had plenty of time, even though I slept late. We ended up taking breakfast as a café overlooking Le Havre plage before heading back almost past the hotel and heading back to Abbeville. With time on our hands, the drive to Bully-les-Mines was made without resort to toll motorways. We stopped briefly for coffee (or beer for non drivers) and a sandwich about an hour before reaching our destination. Bully-les-Mines is a former mining town, (the clue is in the name) just outside Lens. It seems better built up than Gonfreville, but also very closed on a Sunday afternoon. Refuelling the car was done by use of a petrol station with automated payment. We closed in on the ground just under an hour before kick off. Parking was impossible on the road outside, but we found a place nearby. 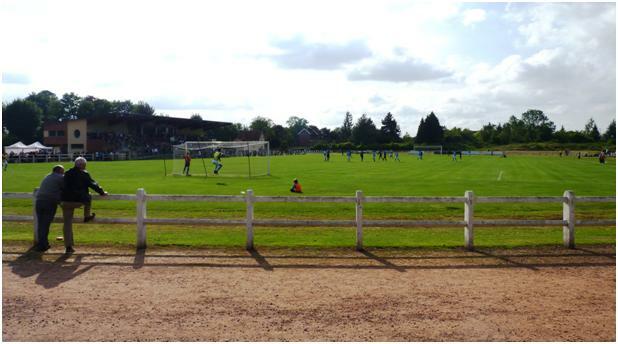 Etoile Sportive Bully-Les-Mines (ESB) play at the Stade Rene Corbelle, a municipal facility, but without a track. It once had a cinder track, but most of this is grassed over, while one straight has been lost to the new stand. There is a bar and refreshments at the top of the stand, and a balcony with the seats below it. Because the bar has a curved front, there are actually fewer rows of seats in the centre than the wings. It is also possible to watch from any point around the edge of the ground, where an old concrete barrier runs outside the old track. There are a few steps of terracing on the far side to the main stand, and this is a very popular viewing point. There are three more full size pitches between this and the railway lines. I have long thought that passion in French Football is a product of the North, with the best supporters being the followers of Sang et Or, the blood and gold of Racing Club Lens. It appears that this spills over to the neighbouring towns. 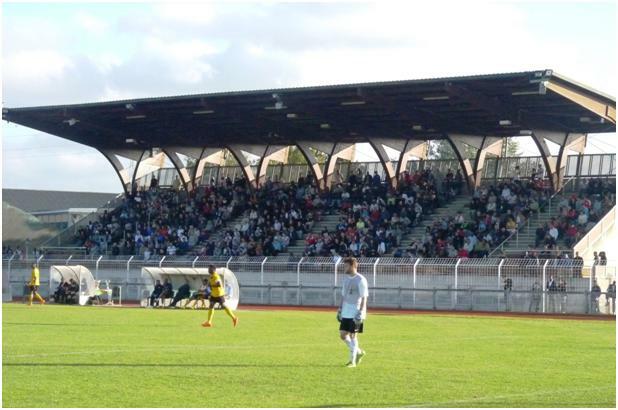 ESB sit two divisions below Le Portel Stade, the visitors who play in Division d’Honneur. If the standard policy when entering a cup match as underdogs is to sit tight and hit the opponent on the counter, this news has not reached the North of France. The policy of Bully was to hit them quick, and hit them hard. By the ninth minute Portel were already reeling from the onslaught and it was no surprise when Bully went ahead, and two minutes later, it was 2-0. Le Portel appeared capable of playing better football, but could not match the home sides desire to win. We thought the corner might have been turned when the visitors pulled one back with still only 23 minutes on the clock, but we were wrong. Bully were not finished by a long way, and powered forward again and again, soon returning to a two goal advantage and increasing this with a fourth goal just before the break. In the second half, Le Portel struggled to come to terms with the disaster of the first period. They had more of the ball, more chances but Bully now defended resolutely, having something worth defending. There was only one goal in the second half, as the score was brought back to 4-2, and in fact there were almost as many close calls when Bully counter-attacked as created by Portel trying to get back into the game. I appreciate the idea that allowing more changes, and hence more players to take the field could mean better player retention, but it seems that the rules are used to break up the play with masses of changes after the break, and players off the field for just a minute or two. Sale Town of the Cheshire League, for example made 7 changes in 90 minutes when I saw them lose to Grappenhall with one player returning after missing ten minutes of play, and one of the players on the pitch for just three minutes. If a player regularly only plays in the final five minutes, is he really going to want to stay with the team. In my mind, a better solution would be to continue to limit the number of substitutions during play, but to allow extra substitutes to take the pitch at half time. Hence the replacements would generally get 45 minutes of play, while the option is still there to make changes in case of injury or to change the tactics. After the match, it was onto the motorway and back to the channel as fast as we could go. I had not been able to book the later ferry so we wanted to make sure we go the one booked. We made this with a few minutes to spare, and in fact found the boat to be half empty. Overall, this was a good weekend away. Thanks as always for Paul and Kevin for the company. This entry was posted on Friday, June 20th, 2014 at 06:50 pm and is filed under The European Game. You can follow any responses to this entry through the RSS 2.0 feed. Both comments and pings are currently closed.